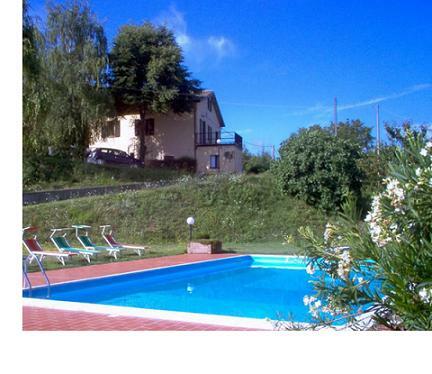 Need a genuine Farmhouse Holiday in the Marche? Le Fontane is just the place. Tucked away in the gorgeous Le Marche countryside you enter into another world on arrival here. A world of immense peace and tranquility. Here time follows the rhythms of the seasons and not those of man-made deadlines. Le Fontane lies just five kilometers from Urbino – one of the loveliest towns in Le Marche. The farm is a working farm producing world-renowned walnuts and hazelnuts. The accommodation options consist of four restored farm buildings. These have been converted into apartments of various sizes. The result is that there is sure to be the perfect place no matter the size of your group or family. From one person through to six you should find something to suit. There is just so much to do here – both on the farm and in the surrounding countryside. On the farm itself you can spend lazy days relaxing besides the pool, exploring the farm, playing tennis or practicing archery. I would suggest that you take the time to discover the surrounding towns and villages either by car or bike. You will be very glad you did – some of my favourite places in all of Italy are to be found nearby – these include Urbino and the absolutely stunning hill town of San Leo. The independent republic of San Marino is also a short drive away however these are only some of the not to be missed places - there are plenty more. The friendly owners MariaGrazia and her husband will be more than happy to help you to discover their delightful world. Ask them for some great insider tips on where to eat. The country style restaurants around these parts are superb. Le Marche Italy is a gorgeous region and Le Fontane is the perfect base to explore. Three of the loveliest places in all of the Marche...click here. For more information please contact me below.